LISTEN TO MY RADIO SHOW: From the archives of radio station WXAM in Charlottesville, VA. The “live” broadcast of "In Touch with Noreen Renier". Renowned psychic Noreen Renier will give the engrossing personal account of how she began her career as a psychic detective, including accounts of some of the many murder and missing person cases she has been asked to investigate. This fascinating, first-person true crime lecture brings the audience directly into Noreen's world – in which reliving emotionally shattering and physically violent experiences is all part of the job – and underscores the humor and courage of this truly original woman. Here are my latest newsletters to keep you informed. The conference was an overwhelming success! The association assembled an impressive lineup of speakers. They also drew an impressive group of inquiring, knowledgeable, and truth-seeking attendees. Comments about my lecture: We loved the anecdotes of Noreen Renier. Her light hearted and down-to-earth way of telling her story was so amusing and absolutely fascinating. 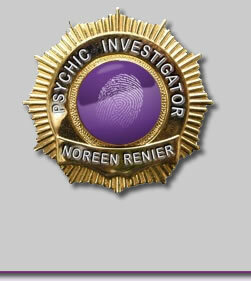 Noreen has assisted Law Enforcement Agencies with information obtained by psychic means for years now. Noreen works mostly with a technique called Psychometry (sensing the energy from objects or direct environments). She is the only Psychic who was ever invited to lecture at the FBI academy in Quantico. I don't feel like I need to say much about Noreen's talent. She's one of the top police psychics in the business, highly experienced and with a long track record of success. This is one woman whose gift is genuine. Perhaps the real surprise here is that she's also a highly talented writer. There are a lot of reasons to like this book. If you like a gripping story, this is full of them! Case after case of psychic readings she has done over the years -- many of them murders Noreen Renier has 'experienced' psychically (from the viewpoints of the murderers as well as the victims) while helping the police, FBI, and concerned family members solve a crime. If you're a policeman (or like me, a parapsychologist), it gives you useful tips for how to work with a professional psychic and get the most out of him or her. Lastly, if you're a psychic, it teaches you some handy tips for how to approach your craft, including the advantages of information sheets (detailed in the book) to guide those who seek your help. I've read a number of autobiographical accounts by psychics over the years. This is the best of them. Not only is the material fascinating -- you won't want to put the book down until you're done -- but it's well-organized (a trait that few psychics have) and told in a casual style which makes you feel like you're relaxing with Noreen over a cup of coffee, listening to her talk about her life. She comes across as a smart, shrewd, funny woman, one who is fun to be around and a pleasure to read about. I highly recommend this book to anyone. Buy it. Then settle down and prepare for a really good read! This Book is so awesome and I couldn't put it down. This woman is Blessed! She has inspired me to start using my mind in more ways. ************ You have to read this book. I saw her work on Court TV and she is amazing. The book is a fun read and if you like Court TV, Law and Order and the current show Medium--You'll love this book. I hope there are plans for a follow-up book, because I read this during a long car trip and couldn't put it down, I was even reading pages of it out loud to my husband a real cynic and even he was impressed -- Buy this book, get in a comfortable position and keep the lights on because its going to be a long night with a great book. Really interesting biography on the awakening of psychic abilities. Gives you a real inside look at how psychic investigator works. You will recognize this psychic if you watch Court TV's Psychic Detective. I read a lot of books on psychic abilities, experiences and how the authors' skills are developed/honed. I have to say this is one of the better ones aside from some minor grammatical errors. It keeps you interested and I finished it quickly. Some books laid out the psychic experiences like a straight transcript devoid of all feelings, and which creates a lot of empty spaces on the pages. I'm glad this book wasn't written that way. There were some instances when I was confused as to whom Noreen was "being", but that's why I have the book so I can always look back & forth a few lines to be sure. I've been anticipating this book since before it was released and Noreen doesn't disappoint. I'm glad for the paperback release as well, since I don't want to spend over $20 for a book without reviews yet. If you are intrigue by psychic abilities, read this, you won't be disappointed! I found the book to be fascinating, and sometimes chilling. I've never before taken the concept of "psychic detective" seriously. Now I'm wondering. It took me less than two weeks to read Noreen's book, and then, I wanted to read it again. I think that everyone should read her book. Noreen Renier is very talented, and she's excelent at what she does. This book could open the eyes of so many people; it would let them see inside the psychic world, which is unknown to most people. Its very fascenating and interesting to read it, and see how she learned and grew over the years to later become a Psychic Investigator. The book was written in the way that I like best. As I read it, I could emagine and picture in my mind everything she wrote about, the stories she told, the things that happened to her; it was all so clear to me how and why she bacame what she is today. Noreen is the most experienced, most credible psychic I know, and she's the greatest! I have seen other psychics and have read other materials related to psychics, but no one and nothing else out there could ever come close to being anything like Noreen Renier. 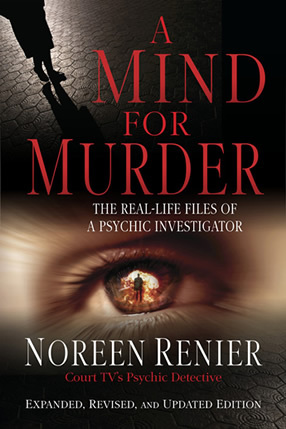 Her book, "A Mind For Murder," tells everything about the true life files of NOREEN RENIER. The author, Noreen Renier, a psychic who has frequently appeared on Court TV ,offers fascinating " you are there" accounts of some widely diversed criminal cases in which she worked in an interactive role with various police agencies to provide previously missing pieces of the puzzle for these forensic investigators to assemble in a new way. She is the only psychic who has lectured at the FBI Academy and who has won libel damages in court from a critical skeptic who publicly said she was making fraudulent claims .This book was riveting in the way it held my attention as she traces out how each challenging case unfolded. I very much like to commend Noreen Renier's work and her accuracy as a psychic detective. My mother's case was depicted in this book. She was the best psychic detective we had among other top psychic detectives we worked with who were George Anderson and Sylvia Brown. One key point that wasn't illustrated in this book is that Noreen had an artist draw a picture of my mother's killer before we had any arrest on the case. After 18 years, an arrest was made and this person was an exact replica of the picture Noreen drew. This person is now in prison for premeditated first degree murder. Noreen can help so many people with her psychic talent and hope that she continues her psychic work and helping others. She is a very talented psychic. In the Official Publication of the International Remote Viewing Association, Volume 4, Number 1, Issue 13 The following is a review of my lecture that is now available to the public. $13 which includes postage and shipping cost.